The easiest way to totally transform your hair is by incorporating bangs. Bangs or ‘a fringe’, can completely change the way you look, framing your face and adding a different dimension to your hair. Admittedly, it’s more work to keep on top of, but as this gorgeous gallery will prove, it is worth the effort completely. Here are our favorite long hairstyles with bangs. This stunning lady is looking absolutely incredible – especially because of the gorgeous bangs which finish off this look! 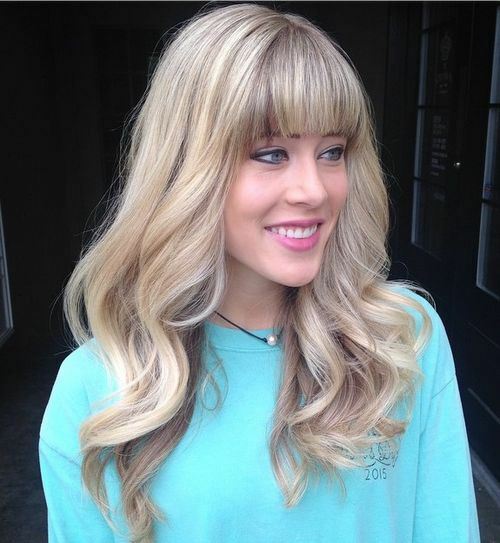 Her hair blends from a wonderful and deep brown right through to a lovely blonde at the tips. The brown fringe is impeccably straight and works right across the forehead, framing the face to perfection. Her hair is straight and sleek, but flicked at the ends for a wonderful style. This lady is looking incredibly pleased with herself, and we think that it’s to do with her absolutely incredible! This amazing feather hairstyle is full of amazing layers from top to bottom, accentuated by the light brown highlights that gently kiss the ends. She’s also chopped a thick brown fringe across the forehead which frames the face perfectly. We absolutely adore this perfectly autumnal look, which blends from a glossy black to a lovely dark brown from root to tip. This fashionable lady’s hair is in such gorgeous condition and it’s oh so shiny – which works perfectly with the straight and sleek style. The look is finished with a black side fringe which is the ultimate finishing touch to the look. This utterly stunning hairstyle has stolen the hearts of the Styles Weekly office – we absolutely adore this beautiful fall favourite colour. 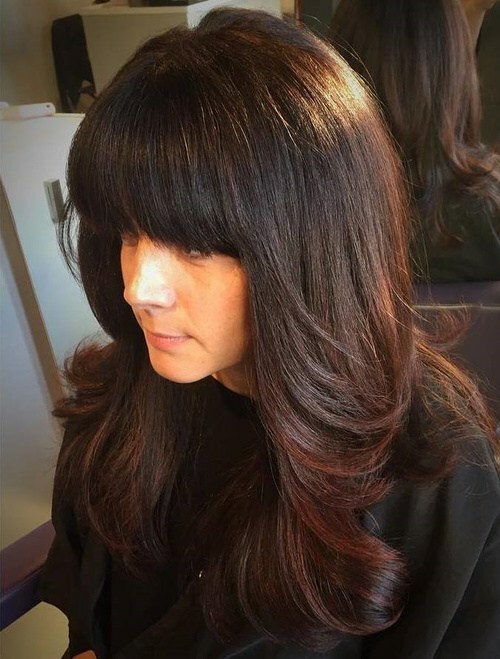 In a stunning mahogany shade of red brown, this lovely lady’s hair has been styled into beautiful ringlets from around the ear level down, falling in perfect curls below her shoulders. 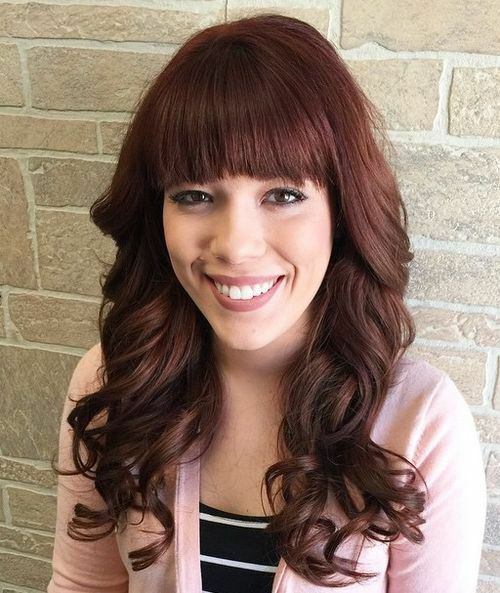 The look is finished with straight and stylish bangs. Stop right there, because this might just be the most fabulous hairstyle from our gorgeous bangs gallery. This incredible hairstyle is oh so gorgeous! 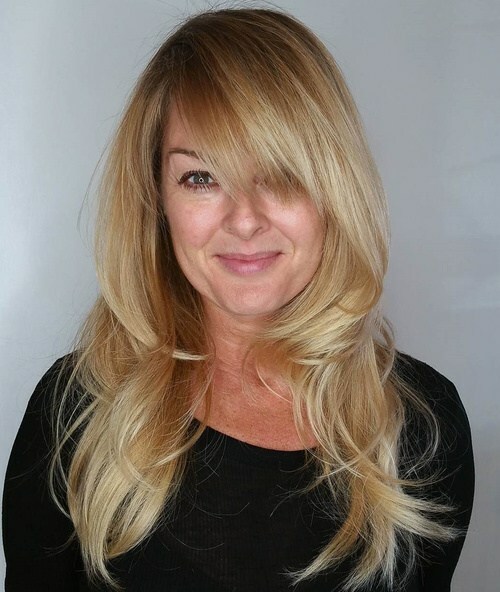 The blonde locks fall in gorgeous layers framing the face to perfection, with the ends loosely flicked and curled under to create this amazing voluminous look. Finished with a side swept blonde straight fringe, this style is hands down one of our favourites. 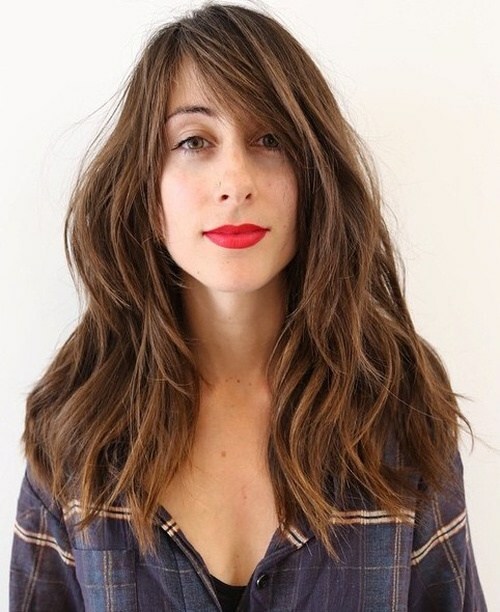 Balayage is one of the most natural hair techniques to combine two beautiful colours together. Blending from a rich and dark brown into a stunning caramel shade of blonde which kisses the ends of the hair. 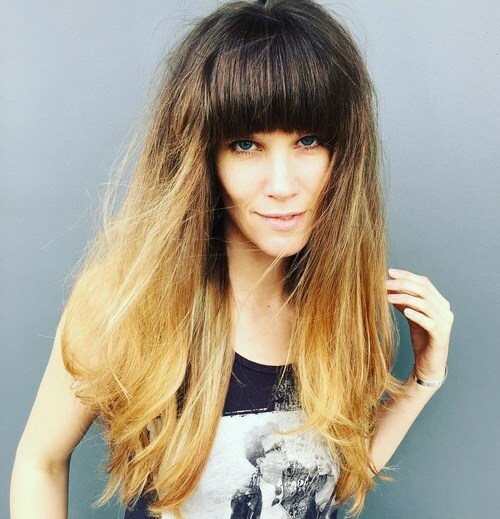 She’s added a gorgeous loose wave throughout the ends of the hair, and finished with a strong and straight fringe across the forehead in her natural brown. Another lovely look simply full to the brim of layers which we can’t get enough of! 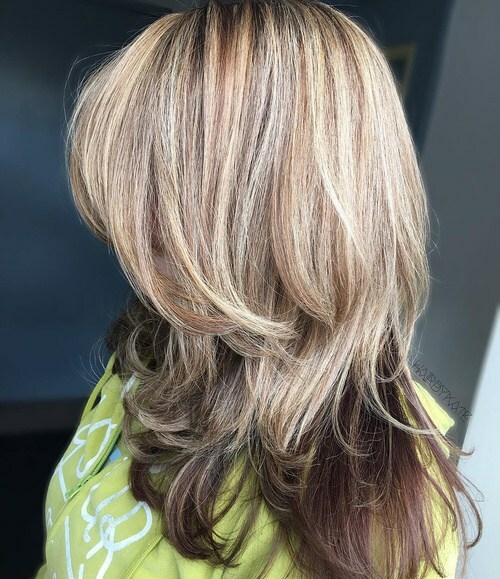 This incredible style is blonde and full of highlights on the top level, with a deep and dark brown layer peeking through the bottom. Full of layers with lots of lift and curled ends, we adore this style. The side bangs finish off the hairstyle absolutely perfectly, don’t you think? 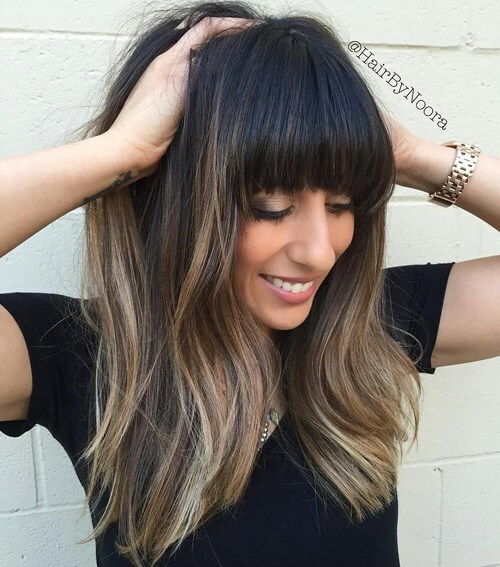 Another utterly stunning hairstyle which prove bangs are most definitely the way forward! 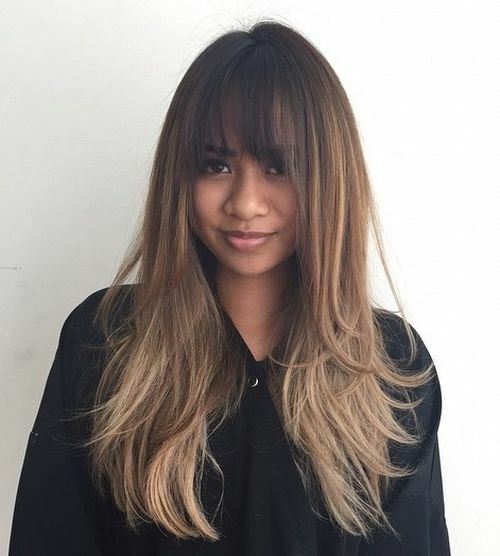 Her hair blends from a gorgeous light brown to a remarkable caramel blonde through the stunning ombre transition which melts the colours together so perfectly. The hair is loosely curled and finished with this incredible long fringe, slightly parted in the centre. Another stunning style which is simply perfect for the Autumn and Winter seasons is this glorious ombre hairstyle full of colour! From the deepest and darkest glossy brown at the top of the head, blending into a striking copper shade at the ends; the hair is brought to life by the loose curls throughout. It’s finished with choppy, straight bangs straight across the forehead. This lady’s simply beautiful long locks are to die for – and so on trend! 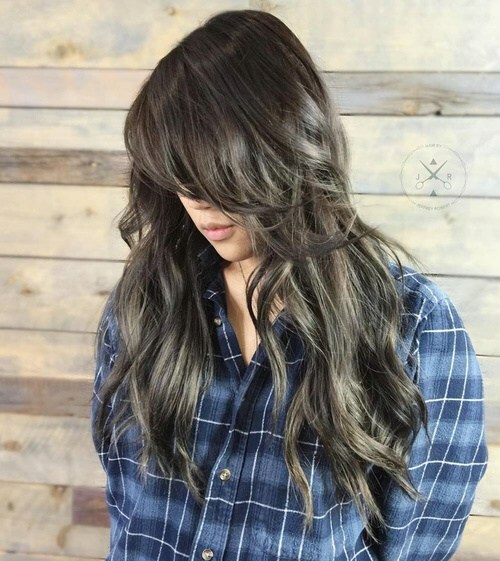 With an ombre blend from a glossy and shiny black to an incredible grey shade at the ends, the colour transition has been amplified by the beautiful curls throughout the locks. The hairstyle is finished with this stunning and graduated sweeping fringe that is perfection. We absolutely adore this shaggy hairstyle which is full of style and personality. 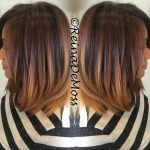 This incredible brown hairstyle is full of choppy layers running from top to bottom, creating this amazing and rugged finish which looks incredible. The side fringe sets off the look perfectly, and we simply adore this textured and tousled finished result. This absolutely stunning style is edgy, unique and oh so contemporary – which we simply cannot get enough of. Her hair blends from a striking chestnut brown into a gorgeous and vibrant bleached blonde at the ends, but the star of the show are those short and choppy bangs which are blunt and fabulous. We adore this finished look, don’t you? As another one of our favourite looks from this gallery of gorgeous bangs, this hairstyle is quite the showstopper indeed. This lady’s breathtaking chestnut brown locks are lifted with beautiful toffee colour highlights throughout, blended together with the amazing ringlets she’s worked into the hair. The front of the hair is cut into this stunning sweeping fringe to finish the look off impeccably. Copper is without a doubt one of our favourite shades for long hair – and taking one look at this gorgeous lady and her amazing hair will prove why! Her lovely long hair is loosely tousled for a textured finish, and full of layers working throughout the length of the hair. The fringe is graduated and swept to the side to create a lovely end result. We think that curling the ends of the hair under creates an amazing finished silhouette, which is exactly why we’re so in love with this gorgeous lady’s style! 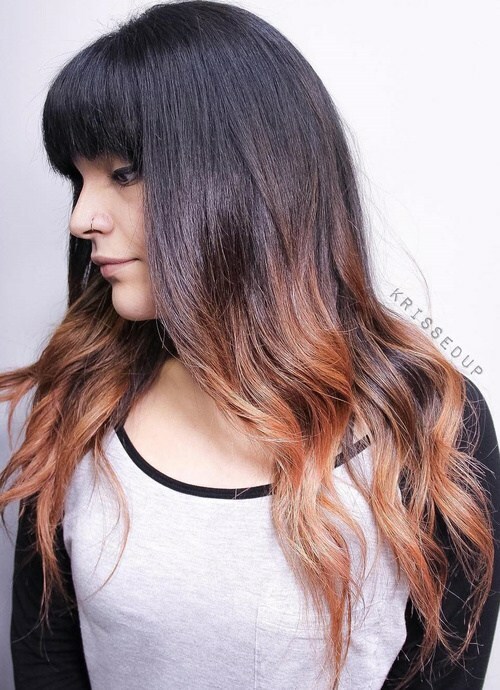 Her copper hair has straight bangs across the forehead, and the rest of the hair blends down towards the shoulders in lots of choppy layers, all of which have been curled under for an amazing finish. This striking hairstyle might just be the glossiest from our bangs collection – don’t you agree? Her hair has a simply striking ombre blend from a deep and dark brown shade into a mahogany red tone at the ends. Big barrel curls run through the ends to create an incredible silhouette. The look is finished with a gorgeous and thick fringe. This absolutely stunning icy blonde hairstyle has truly captured the hearts of the Styles Weekly – and is it any surprise why? 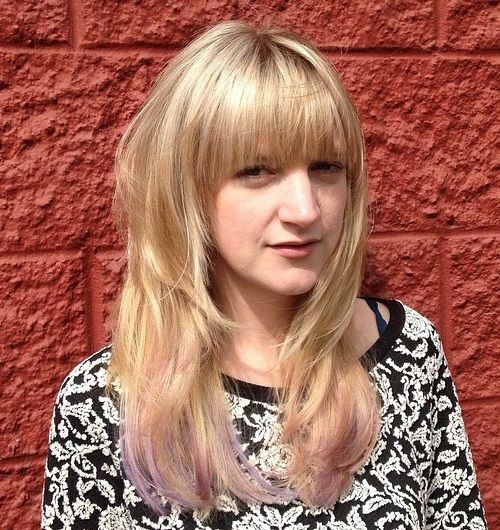 This incredible blonde style is full of icy white highlights and is finished with a stunning side fringe. The hair falls a few inches below the shoulder, and the ends are curled under for an incredible and unique style. 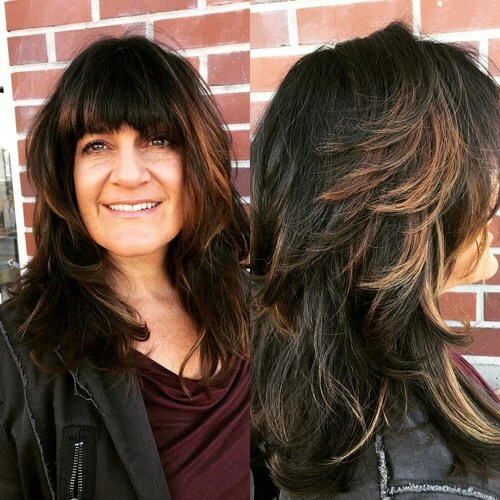 This absolutely lovely lady has really worked the bangs trend into her look in style! Working her gorgeous blonde locks into a long bob which falls just below the shoulder, she’s added a pop of colour by adding lilac to the ends of the hair! 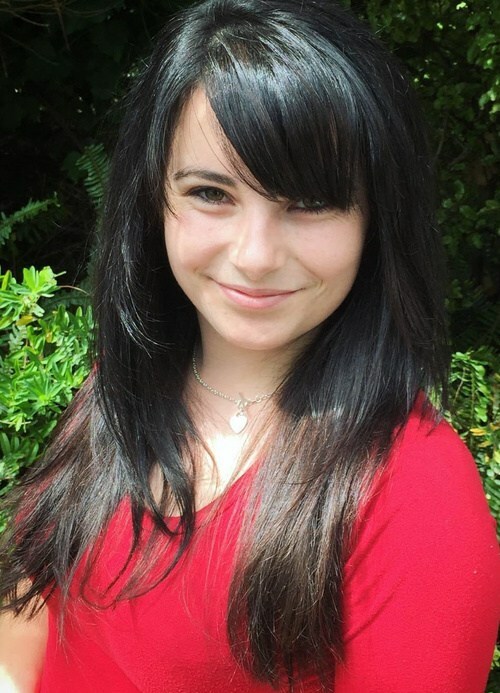 The fringe is blunt and straight across the forehead, complimented perfectly by the loose layers throughout. This utterly gorgeous lady has even more gorgeous hair – as we’re sure you’ll agree! 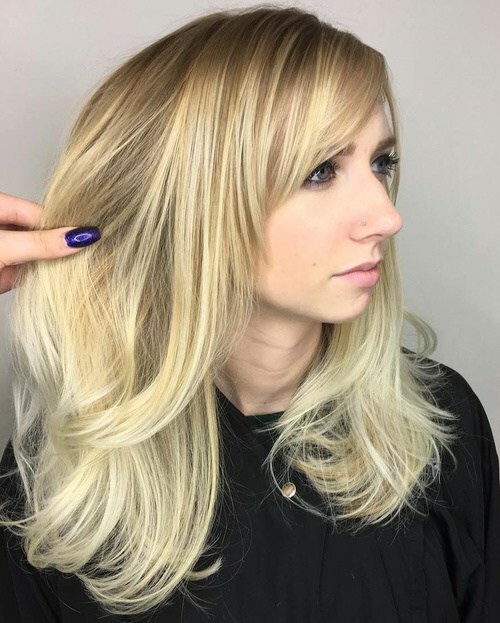 Her beautiful blonde hair is full of a range of lovely blonde highlights which add lift and light to the locks, which she’s absolutely curled to perfection from around the ear length downwards. The look is finished with straight and sleek bangs right across the forehead. This look is one of our more dramatic in the gallery, but that doesn’t mean that it looks any less incredible! Working form a dark brown to a striking honey shade of blonde through the impeccable ombre technique, we just adore this multi-tone tousled look – not least because of the thick fringe which sets the entire style apart! This is another one of our favourite looks – we think it’s absolutely perfect for a day to night transition! The hair, which is full of vibrant shades of blonde from root to tip, has been loosely curled from top to bottom to create this amazing finish full of bounce and volume. A straight fringe has been added to frame the face to perfection. This gorgeous lady has beautiful hair worthy of a mermaid – and we simply cannot get enough of it! 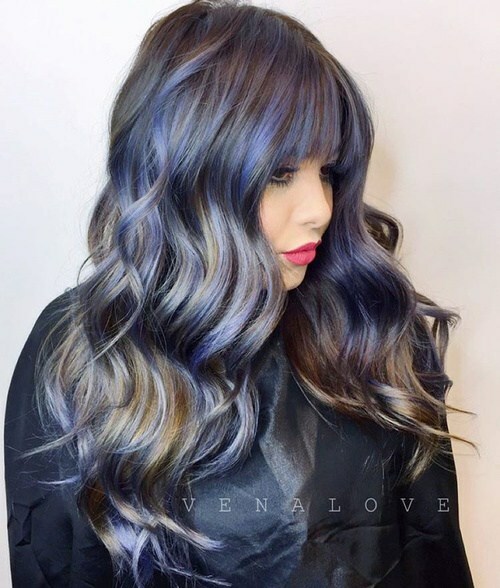 A remarkable hybrid of blue and brown, these luscious locks are worked into beautiful barrel curls from top to bottom to create this perfectly glamorous style. 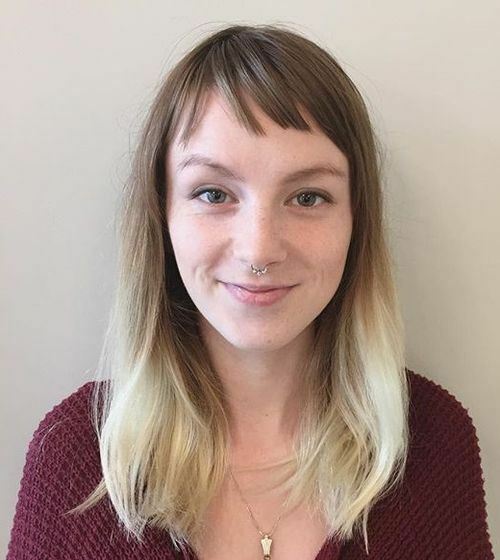 Finished with straight bangs right across the forehead, this look is for the brave and beautiful. And there you have it – our gallery of gorgeous hairstyles with bangs, ready to inspire you to be daring with your next hairstyle. Which look was your favourite – a full fringe or a sweeping side fringe? Comment below and let us know!